Mary Carlisle, an angel-faced-blonde actress who often played spunky-but-innocent ingénues in scores of Depression-era films, died on Aug. 1, in Los Angeles. She was 104. The death was confirmed by her son, James Blakeley III. From 1932 to 1939, when she was in her late teens and early 20s, Ms. Carlisle made 50 movies, including three musicals opposite Bing Crosby: College Humor (1933), Double or Nothing (1937) and Doctor Rhythm (1938). Even in pre-Code films (those made before censorship ruled Hollywood studios) like Should Ladies Behave (1933), she was more curious than sinful. 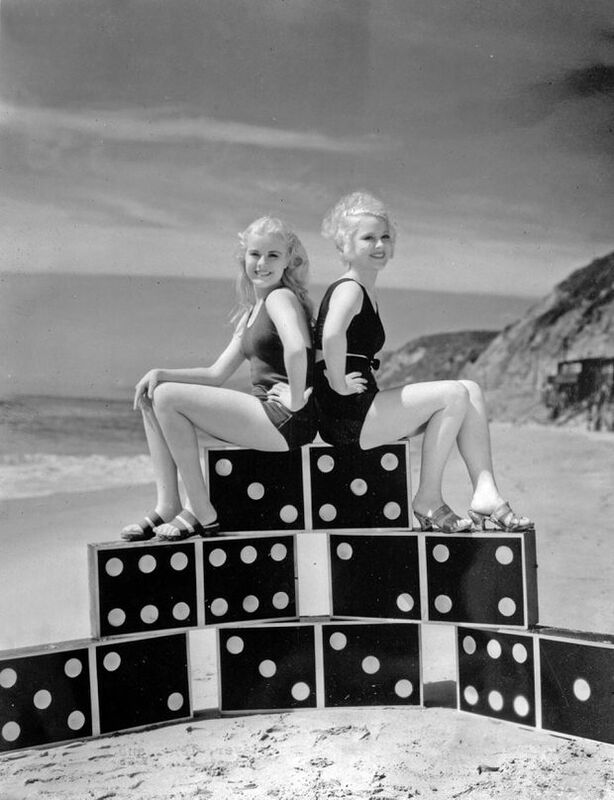 Joan Marsh and Mary Carlisle, right, sit back-to-back on giant dominoes on a beach. She was born Gwendolyn Witter in Boston on Feb. 3, 1914, the daughter of Arthur William Witter and Leona Ella (Wotton) Witter. In later years she refused to confirm her age; some sources give her birth year as 1912. After her father died, when she was four (or six, or any other number of ages, depending on which 1930s interview you read), she and her mother moved to Los Angeles, where an uncle worked as a film editor. Gwendolyn later took her stage name from her maternal grandmother, Mary Ella Carlisle. She was discovered, at 14 or so, having lunch at the Universal Studios commissary with her mother. She was noticed by the studio executive Carl Laemmle Jr., who insisted that she be given a screen test. After a couple more years of formal education and at least 10 uncredited movie roles (party guest, autograph seeker and – in Grand Hotel – giggly newlywed), Ms. Carlisle made her official movie debut in This Reckless Age (1932), about a family with ungrateful college students. From 1922 to 1934, the Western Association of Motion Picture Advertisers (WAMPAS) named more than a dozen promising young actresses “Wampas Baby Stars” as an annual publicity stunt. Their number included Clara Bow, Joan Crawford, Mary Astor and Loretta Young. Ms. Carlisle, chosen alongside Ginger Rogers and Gloria Stuart in 1932, was the last surviving Baby Star. Over the next seven years, her films seemed to cover all the genres and every category of leading man. They included The Sweetheart of Sigma Chi with Buster Crabbe, Handy Andy and Down to Earth with Will Rogers, Say It in French with Ray Milland, Touchdown, Army with Robert Cummings, Beware Spooks! with Joe E. Lewis, Palooka with Jimmy Durante, Murder in the Private Car with Charles Ruggles, and a Preston Sturges comedy, Hotel Haywire. During Ms. Carlisle’s heyday, the Hollywood publicity machine was young but prolific. She was written about in major newspapers on subjects as broad as her career plans (“I hope someday to become a great comedienne,” she told The Oakland Tribune in 1937), and as specific as her most recent fashion purchases (a skunk jacket is “so youthfully smart this season for girls my age,” she was quoted as saying in The Boston Globe the same year). As early as 1934, there were rumours of her engagement to James Blakeley, an actor who became a 20th Century Fox executive. When they finally married, in 1942, he was an Army flying instructor. Blakeley died in 2007. In addition to her son, Ms. Carlisle leaves two grandchildren. She retired from acting after playing a vampire’s beautiful young target in Dead Men Walk (1943) and went on to manage salons in Hollywood and Beverly Hills.